Parallel aggregates of very Sharp tetrahedral crystals with a clear salmon color and zonal growth. The analysis indicates that both the external zone and the interior are Genthelvite. We’ll send a copy of both analyses to the buyer. A novelty at Munich 2011. 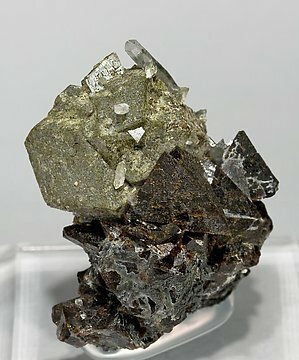 Group of sharp tetrahedral crystals of Genthelvite, one of them clearly dominant, with a dark brown color, translucent edges, in matrix, and related dodecahedral crystals of Andradite. Excellent quality for the species. We’ll send a copy of the analysis to the buyer. 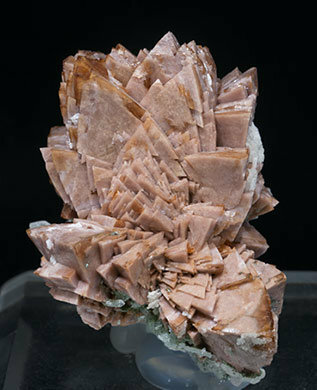 Very aerial group, on a Calcite matrix, of very sharp tetrahedral crystals with a clear salmon color and zonal growth. The analysis indicates that both the external zone and the inner crystal are Genthelvite. We’ll send a copy of both analyses to the buyer. 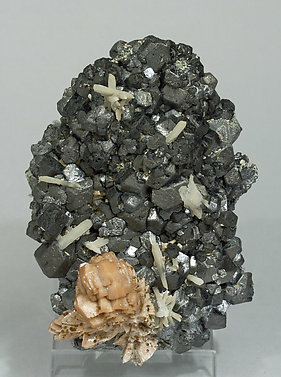 Aggregates of very sharp tetrahedral Genthelvite crystals on matrix, with Magnetite and Arsenopyrite crystals. The Genthelvite crystals clearly show zonal growth, so we did two analyses (inner and external), both resulting in Genthelvite. We will send a copy of both analyses to the buyer. 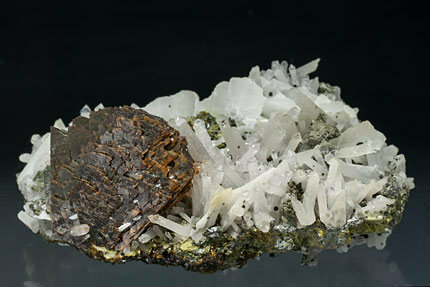 Very aerial group of Genthelvite crystals with very well defined faces and edges, a warm cream color and on a matrix of dodecahedral Magnetite crystals with small Quartz crystals. An analysis of both the core and the surface indicates it is only Genthelvite, without Helvine. We’ll send a copy of the analysis to the buyer. 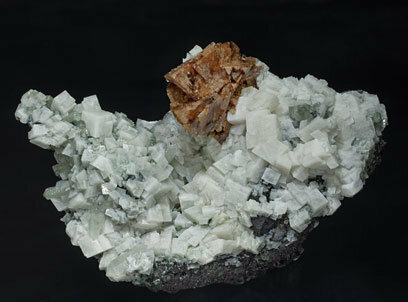 Aggregate of very sharp tetrahedral Genthelvite crystals on a Magnetite matrix, with white rhombohedral Calcite-Dolomite crystals, Arsenopyrite, Quartz and Fluorite. As the close-up view photo shows, the Fluorite is especially clear. The analyses at different depths of the crystals reveal they are uniformly Genthelvite, without other species in zones. We will send a copy of the analyses to the buyer. 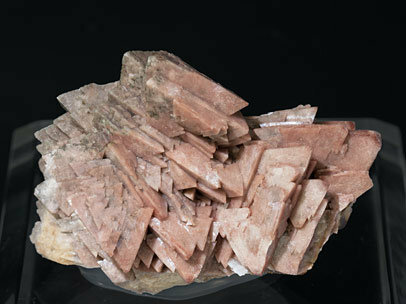 Very aerial aggregate of very sharp tetrahedral Genthelvite crystals with a salmon color and partially coated by Calcite and microcrystalline Quartz. The analysis gives Genthelvite both on the crystal surfaces and in the interior. We’ll send a copy of the analysis to the buyer. 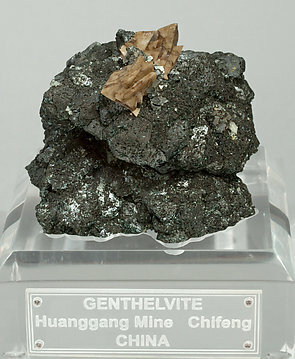 Very sharp polycrystalline Genthelvite growth with a neatly tetrahedral shape and dark brown color. 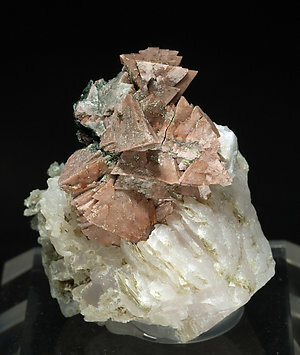 It is on a matrix with Quartz crystals and extremely flattened Calcite crystals (papierspat). Analyzed by Raman, the sample is Genthelvite both on its surface and its interior. We’ll send a copy of the analysis to the buyer.